One of the questions I get asked most frequently is: “how many credit cards do you have?” While I won’t disclose that number publicly, it is a lot, and they are with several different issuers. Keeping track of them is a big task on its own, not to mention the spending requirements. Other than “hurting your credit“, this is the probably the biggest deterrent for people jumping in to apply for more credit cards, and doing App O Rama‘s. Fortunately there are tools to help, and methods to follow to really simplify this as much as possible. 1. Start a spreadsheet. Make sure you include card names, issuers, date of application, anniversary dates, annual fees, what your credit score was, and notes (for anything else you want to list about the card or time of application). I would make this an online spreadsheet so you always have access to it. Google docs is your friend. I would also create another spreadsheet somewhere, perhaps locally since it’s more sensitive but include all the issuers sites and include the username and a hint at what your password for the site is. Don’t use the same password for all accounts. 2. Line up payment due dates. Chase & Citi are great about setting specific due dates for your cards. 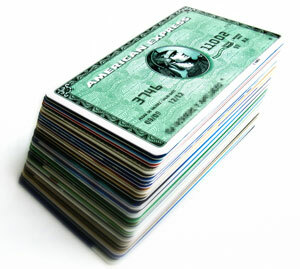 You may end up with 3 Chase cards, 2 Citi cards, 3 Amex cards, etc etc. You get the picture. If they’re all going to be due on the 5th of every month (or whatever day you pick), it’s going to make paying for them a lot easier. You can also set up automatic payments so you’re never late. If not, just log on once a month to each account, and pay all your bills at one time. 3. Keep your cards in one place. Actually two places. You’ll have cards in your wallet, and the rest you’ll keep in a top secret (ok not really) location. You’ll want to rotate them when you have things like the quarterly 5x bonus spending categories, like the Citi Dividend, Chase Freedom, or Discover card offer. Or if a card offers a bonus retention for spending something like another $1000 in the next 3 months, then you’ll want to use that for a short period of time. Anything you’re not using, you’ll know exactly where it is. Everyone’s going to have a different threshold for how many cards they can manage and keep track of. Using the method I’ve outlined, I don’t see a problem managing 50 cards, but that’s me. Most of the process is automated and it doesn’t take much time out of my schedule since I know when cards are due, and when anniversary dates are coming up. This is also why it helps to apply for multiple cards at once, since it’ll line up anniversary dates & annual fees. That’s pretty much it. Get a hold of your life financially and take advantage of everything having good credit and being responsible can offer. My next post in this series is going to go over how to manage all those points you’re accumulating since they’re with all these different issuers and programs. 7 Responses to "Wait, you have how many credit cards? How do you keep track of them all?" For someone who loves spreadsheets and uses it for pretty much everything (almost insanely so), this was one area I hadn’t considered documenting and it bit me in the behind. Just last week, I got a letter that my Hyatt card was closed due to inactivity and for not paying the annual fee that was due three months ago!!! They claim they hadn’t sent it to collections and simply closed the account, but your tip is a MUST if you plan on having multiple credit cards. Live and learn, haha. There’s a site called mint.com. try that out instead of a spreadsheet. If it looks good, I’ll include it in my posts. Thanks for reading and including the suggestion. Serena, that’s an excellent idea. It’s important to be on top of the dates BEFORE they get here. Calendar reminders maybe? You don’t have to create a spreadsheet. http://www.cardbeagle.com keeps track of the data you need to know such as anniversary date, did you reach your minimum qualifying spend and more. It’s easy, secure and FREE.